You are here: Home > Last Chance for Starter Packs! Red5 have been testing the waters with bundled packages lately, to see what the playerbase prefers, and they’re about to retire the current range of bundles. If you’ve been thinking about picking up one or more of these bundles lately – or you didn’t know about them until now – you might want to act quickly before you miss out. Permanent XP boost: 10% for yourself and 5% for squadmates. Permanent XP boost: 5% for yourself. Check out more details at the official Starter Packs purchase page. Note that these packs were scheduled to be discontinued at the end of August. They’ve had a short reprieve, but they’ll definitely be going away very soon. So if you like the looks of these specials, nab them now! This is a special offer that’s pretty easy to take advantage of. It includes a permanent Sunset Glider Pad, the Warfighter Helmet, and a new decal. And you can get this package with any Red Bean purchase, as a freebie on top of the beans you’re buying. This is a particularly great deal that lots of people have taken advantage of, because the Sunset Glider Pad is on a separate cooldown from every other glider pad – you can see how it looks in our Glider Pads guide. This deal is scheduled to end on the 10th of September – which is today, in Red5-land! So if you’re interested in this special offer, you might want to act straight away, because this special’s days are numbered. 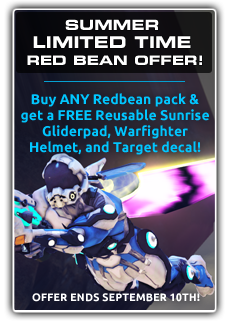 You can buy Red Beans from your account page on the Firefall site, or straight from in-game from the Cash Shop section of the Nav Wheel. 2 Responses to Last Chance for Starter Packs! Sooo the sunset and sunrise are 2 different glinders, right? No, that was just me getting it wrong ;) Thanks for catching that; I’ll fix it now.